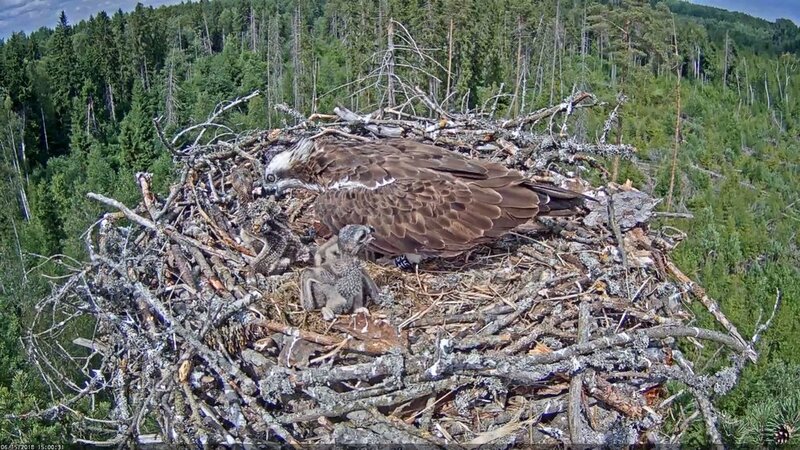 Yes, Sunshine, there were really lot of branches fetched to the nest. I thought they want to build a skyscraper. Don't worry small chocolate is getting enough. Irma is great Mum and Ivo is providing well. Small choco doesn't need as much because he is smaller. 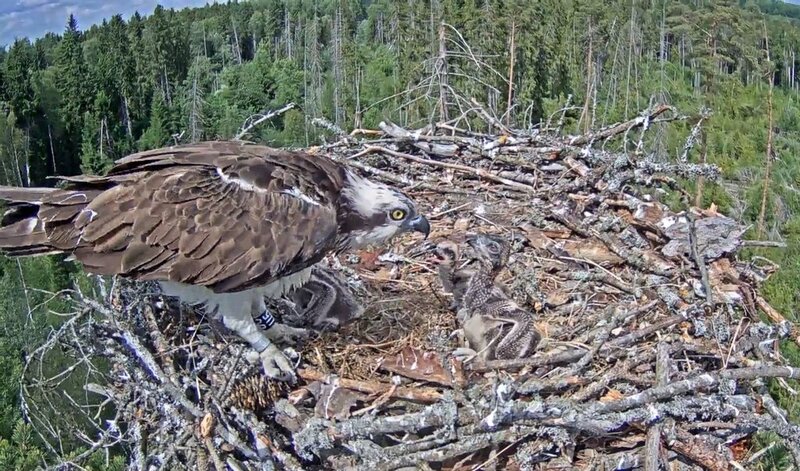 Indeed, Irma is an excellent mother and Ivo is a caring dad! I don't know why, but every time Choco gets a morsel from Irma, I start smiling! Here is what Summi and Sunshine talked about. 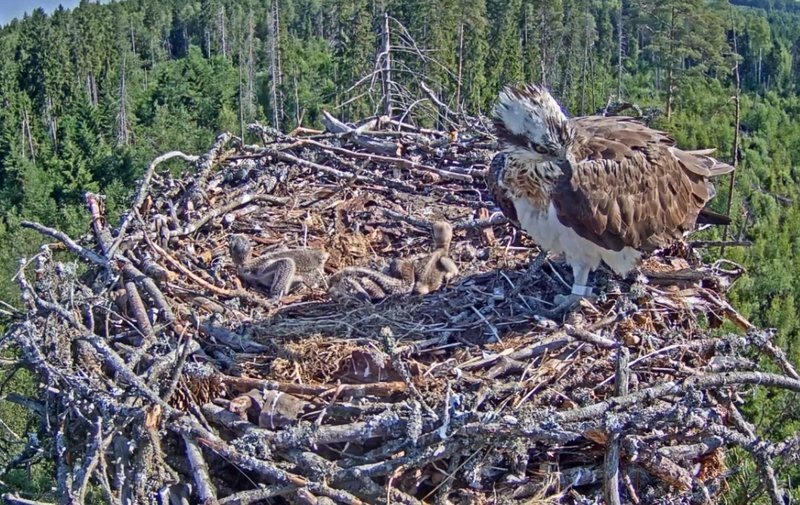 The whole family was on the nest for quite a long time. 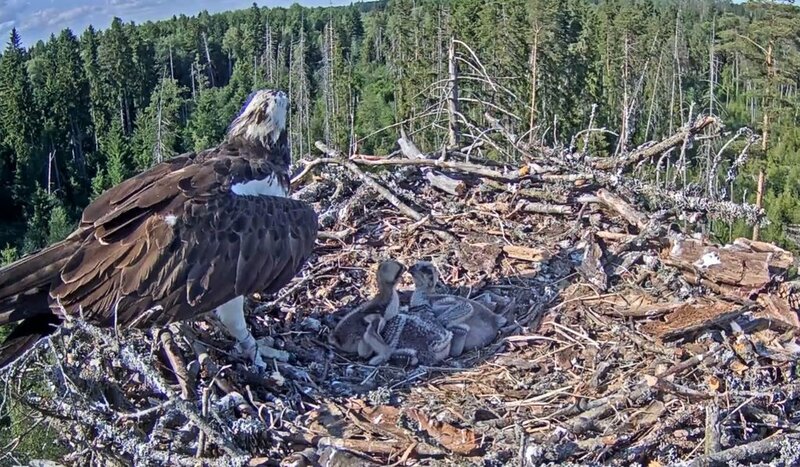 Meanwhile Irma twice stepped on the little one. Smallie appeared a little battered. But no injury seemed to result. Irma is sounding alert already for quite a while.. there is some intruder in the skies. In the meanwhile, the two youngest have an opportunity to work out their relationship. I am taller! No, me! I really got scared watching it "live" and even shouted to Irma Mind your step, don't back up! as if it would have helped. Irma chirps. 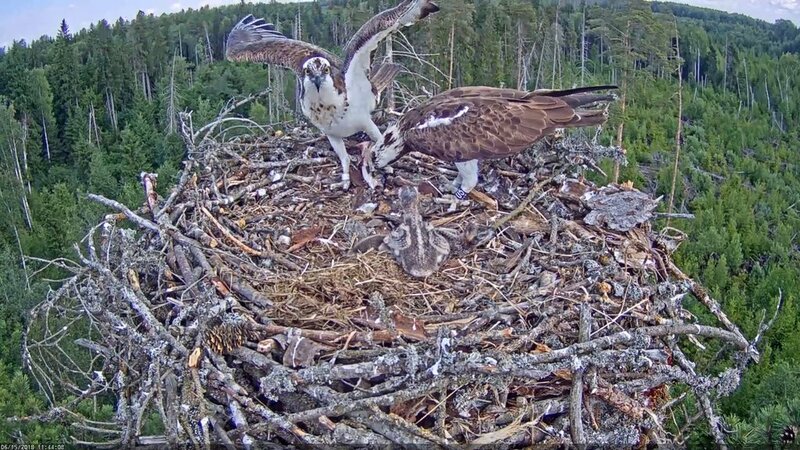 Ivo lands on the nest, too. Ivo carries a fish. 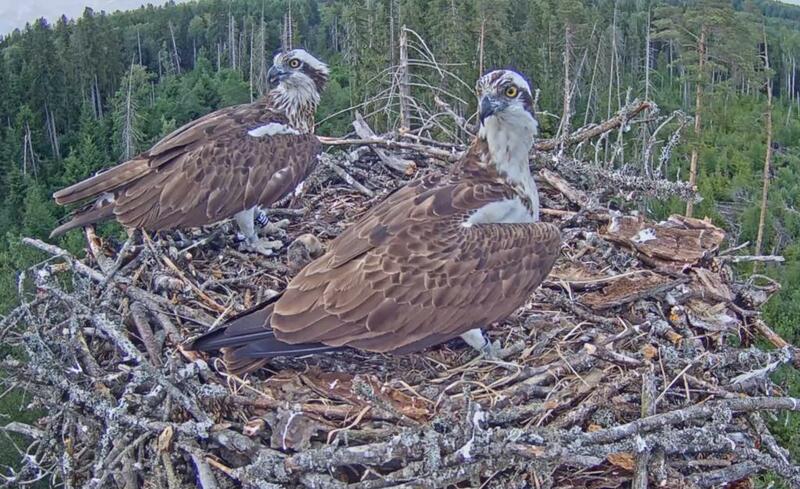 Both look intensively to the skies, mantle and chirp. 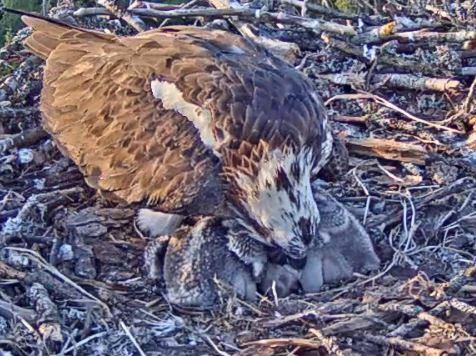 18:19 Ivo leaves, fish on the nest. 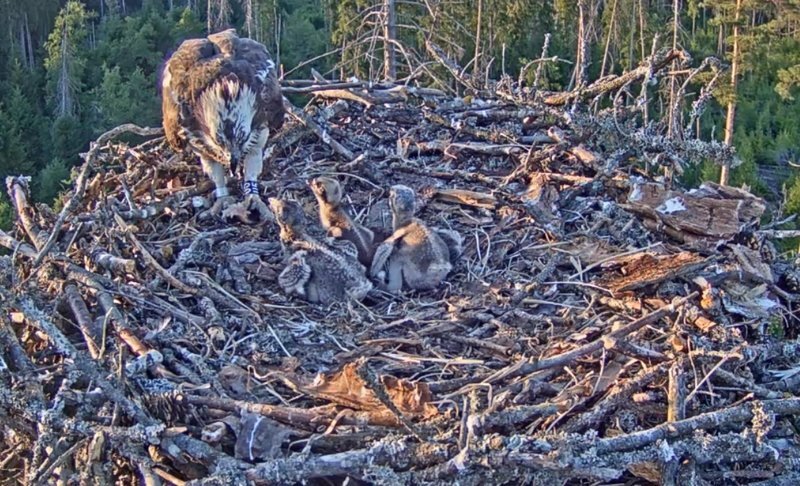 Five minutes later the chicks no longer sit, but lie. 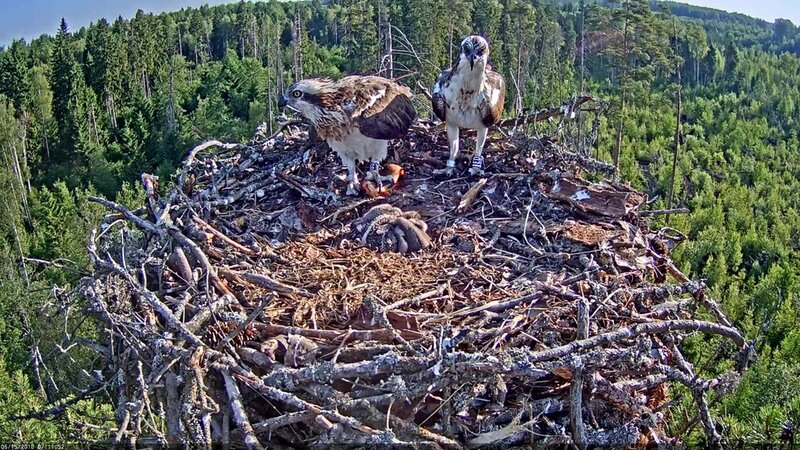 There were flying around two other ospreys for a short time. No problem, no alarm, Irma just looked at them. One appeared in the cam sight. 7:11. Ivo just brought a beautiful fish to his family! in good time, too! 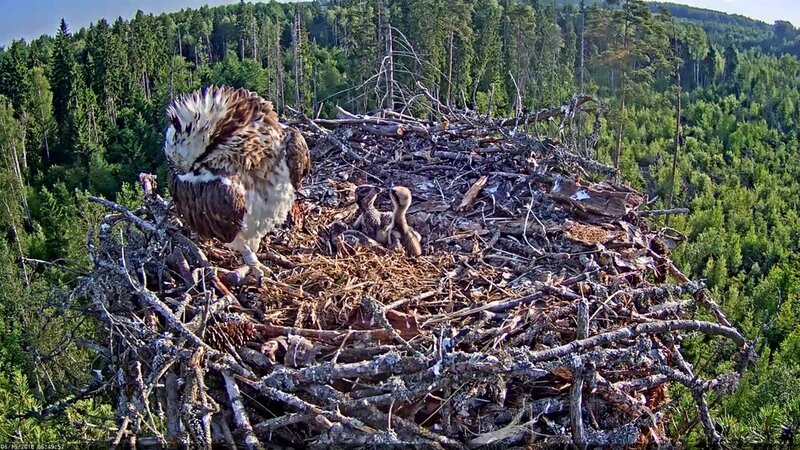 The chicks have been up since Ivo’s first visit to the nest at 4:40. He returned a bit later with fresh hay. But since the kids are up, the oldest one, want to bonk the other 2! 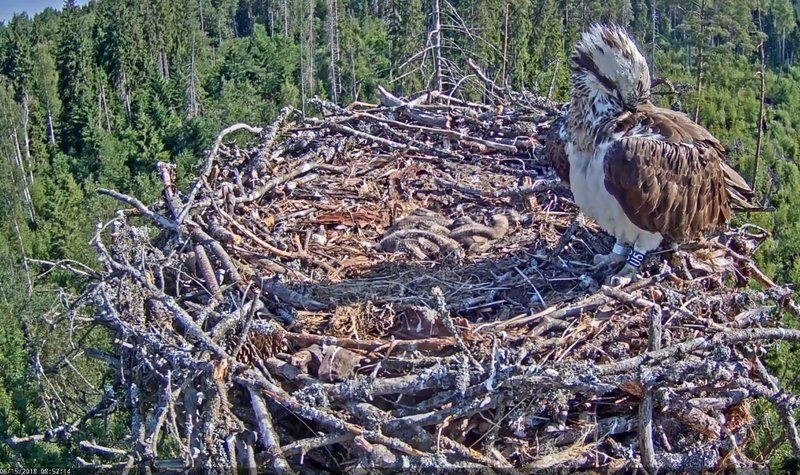 Irma has covered the chicks a few times, but she wants to preen her feathers so the chicks are up! Anyway, all is good! Nice breakfast fish! Hi, Mogga! 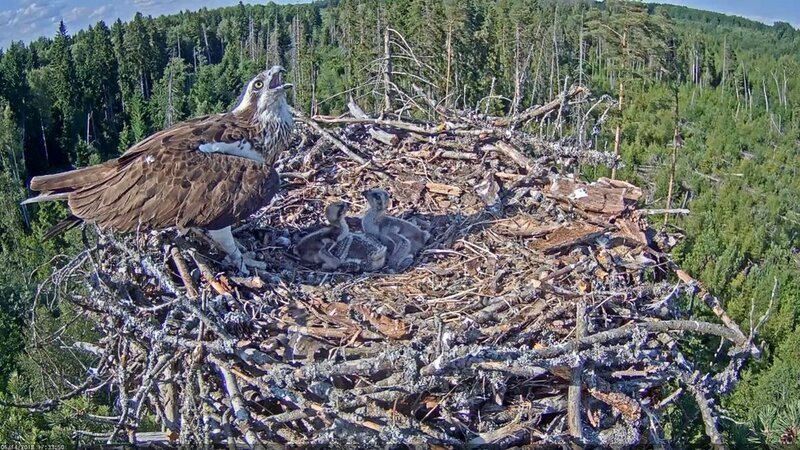 I just watched your video above and I think that was going on earlier at the nest! I heard the crows, but I don’t think that was what Irma, then Irma and Ivo together were watching a bird(s) in the sky. I couldn’t see anything so I’m not certain. 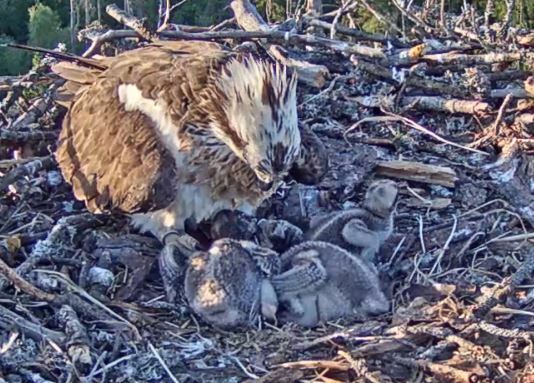 Irma cleans feathers, chicks sleep under the warm rays of the sun. 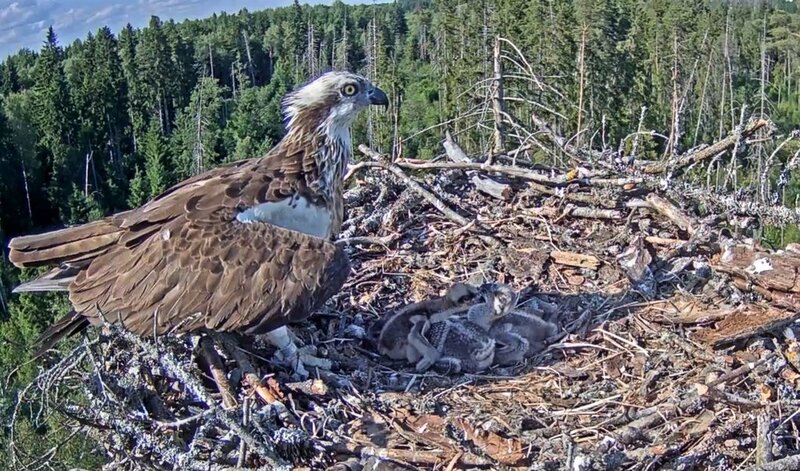 2 chicks woke up and walked along the nest. 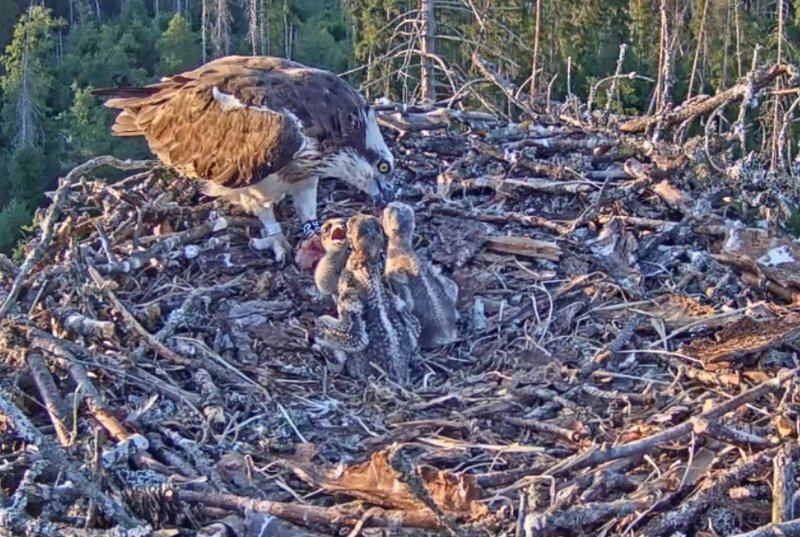 There was an interesting episode at 06:40 a.m. this morning. The small one tried to challenge the Oldie. The little choco was biting the oldest 3 times, and the oldest did not react back. The latter has nerves of steel! At 07:01 the same thing was tried by the Middlie. 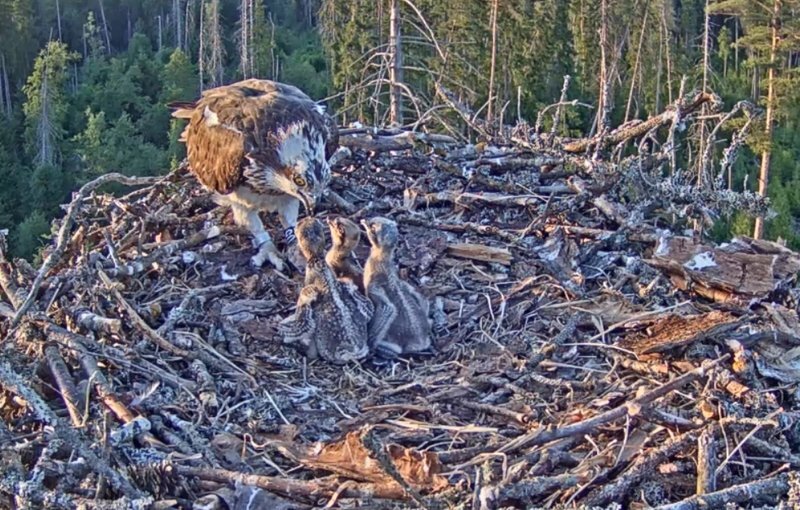 He/she stood up and bit the eldest two times. And again the Oldie did not hit back! By the way, have you noticed that the crow mobbing has subsided? 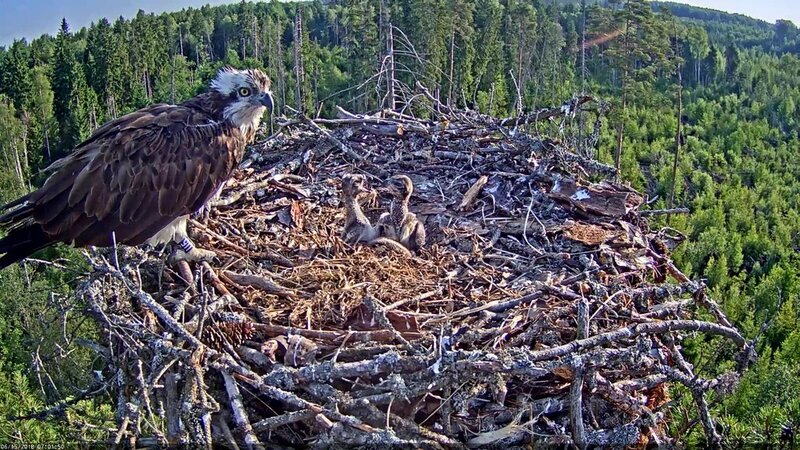 Their young are now out of the nests and they don't really attack the ospreys anymore so much. Yes, Cessie, what you describe was earlier, I don't remember when exactly. But this happened at 22:03 / 22:04. I think there were three birds in the sky. Chasing each other, something like that. 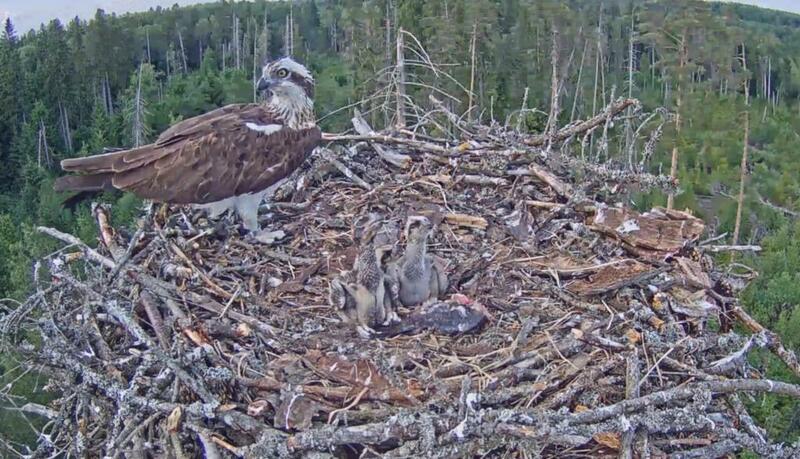 At least one of them was an osprey, anyway for me it looked so. Irma didn't react very much. Just watching it. Little Choco's feathers are coming in as of today! They grow soo fast. Irma is sleepy. Wonder if she had a bad night? Why does Irma put a log on her children?